Feed chart based on 8 week bloom finishing time genetics. Some genetics take longer to finish and, as a result, feed recommendations should be adapted to suit. Switch down times from the18 hour lights on vegetative phase to the 12 hour lights on bloom phase will be determined by plant genetics and the desired finishing height of the plant/crop. ECs are established using demineralized/RO water. Consumers should take into consideration the quality of their local water supply before adding nutrients and additives. Please note: we do not list in ppm, as some manufacturers do, because all ppm meters first measure in EC (electric conductivity) and then run a conversion program to display the reading in ppm. There are three different conversion factors (standards) that various manufacturers use for converting from EC to ppm. Thus, ppm is not a universal standard whereas EC is. Feed charts should be seen as a guide only. 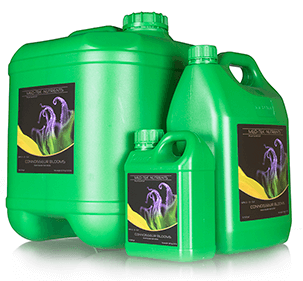 Optimum EC is influenced by factors such as feed/fertigation frequency, temperature and humidity. Feed charts act to help less advanced growers (newbies) refine and develop a more sophisticated fertigation strategy relevant to their style of growing.